Zero: Shah Rukh Khan and Salman Khan's most awaited Issaqbaazi is out now! Red Chillies Entertainment and Colour Yellow Productions come together to bring ZERO, produced by Gauri Khan. 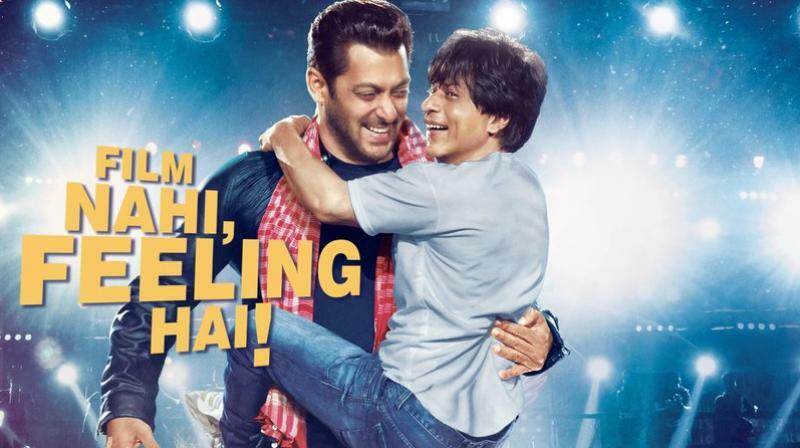 Zero poster featuring Shah Rukh Khan and Salman Khan. Finally, the wait for the audience is over now for the song as the makers release the 'Isaaqbaazi'. A few glimpses of the song were seen in the teaser released at the time of Eid this year. The song is titled as Issaqbaazi which is voiced by Sukhwinder Singh and Divya Kumar, penned by Irshad Kamil and composed by the duo Ajay-Atul. In the song, Bauua Singh is so happy when he is kissed by the ravishing superstar Katrina Kaif that he expresses his happiness by singing the song. Issaqbaazi is a high energy peppy track with desi beats, paired with a dance face off with an outburst of energy takes place between the two superstars Shah Rukh Khan and Salman Khan. The song, choreographed by Remo D'souza, also features him with Ganesh Acharya. Shah Rukh Khan took to his twitter handle and shared, "Akele chale the ishq ke safar par, karne mehboob ko raazi, dost aisa mila raah mein, kar aaye Issaqbaazi.#IssaqbaaziOutNow http://bit.ly/Issaqbaazi-Zero @beingsalmankhan @anushkasharma #KatrinaKaif @aanandlrai @ajayatulonline @irshad_kamil #SukhwinderSingh @aslidivyakumar @remodsouza"
A couple of days back, the makers had released the melodious track 'Mere Naam Tu' which showcased the romance between two equals featuring Shah Rukh Khan and Anushka Sharma. Zero' presents the story of Bauua, a vertically challenged man essayed by Shah Rukh Khan. Set against the backdrop of Meerut, 'Zero' presents a unique as well as rooted story. Katrina plays a superstar while Anushka portrays a specially-abled girl. The leading cast Shah Rukh Khan, Anushka Sharma and Katrina Kaif will share screen space after Jab Tak Hai Jaan.